It requires a lot of practice and you need to be quick on your feet. During a live stream, there are so many things to juggle while talking live to thousands of people. Content, comments, equipment etc. Here are some valuable tips to help you be a better broadcaster! If you have never presented a live stream before, these tips will give a great head start. 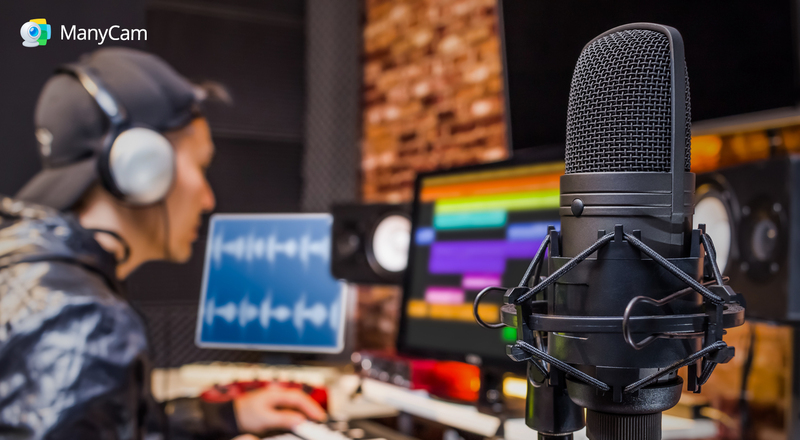 If you already have broadcasting experience, this article can help you improve your broadcasting skills, recover faster from mistakes and manage technical difficulties like a pro. The key to connect with your viewers is being natural in front of the camera. Relaxed, yet energized. But, “stage fright” is a powerful thing. For many, once they sit in front of the camera, nervousness kicks in, straight away. We see many live interviews, where the presenter is so worried about the time and the production, that s/he forgets about the actual content of the interview. Or, due to the nerves, the presenter’s voice might be trembling, too high or too low. Feeling nervous or anxious in front of the camera can completely ruin the way you deliver your message, as well as how it’s received. Your audience might doubt your credibility because your self-confidence isn’t coming across. The good news is, secretly, everyone gets nervous. Specially, when it’s live. And the best part is, you can overcome it or at least, hide it well enough in a “fake it ‘till you make it” way. The only way you can be more natural in front of the camera, is by practicing it. The more live streams you do, the better you’ll get. Also, before every live video, make sure you rehearse a few times. Recording yourself to analyze what you can improve, is a great exercise. Before going live take a few deep breaths and remember to use pauses in your presentation. That can make a huge difference on how people perceive you. It will make your life a lot easier, if even before you begin the live video, you accept the fact that mistakes will happen. Keeping that in mind will help you not to dwell on what went wrong and you’ll be able to recover faster. It also helps to create a contingency plan for your presentation. Think about what can go wrong and make a list. Next to each thing that could go wrong, write how you can prevent it. Next to that, you can write what you can do or how you’ll respond if it actually happens. Creating this plan will, not only help you minimize and remediate the mistakes, but also help control your anxiety and nervousness. Even the simplest live video production experience some glitches every now and then. From our experience, most technical problems can be solved quite quickly during a live stream, if you’re prepared. To learn more about getting ready for a live streaming session, have a look at our Live Streaming Checklist. There’s no such thing as a perfect live stream. And if you think about it, perfection is overrated. Your viewers want to see the “human” part of the brand and they will forgive minor technicalities. To make sure you keep these problems to a minimum, first you need to test all of your equipment. You should also get a backup equipment just in case. By the way, test the backup too. Once everything has been tested, you can do a dry run of your live streaming video. Rehearse, as if you were live. You can even set the privacy settings on Facebook to “private” and go live. This way, you’ll be testing absolutely everything. Record your rehearsal, watch it and make any necessary adjustments. Here you can create a contingency plan, just like you did on the previous topic. Make a list of what can go wrong, how to prevent it and how to respond to it if it happens. With this plan in mind, you’ll be able to act quickly once the problem arises. If you can’t fix it and it’s getting in the way of your message, apologize to your audience, reschedule and carry on. When anything goes wrong, the most important thing is how you respond. Your attitude says a lot to your viewers. So, try your best to not get frustrated and keep streaming with enthusiasm. If you can, try and add some humor to lighten the mood. Remember, viewers don’t expect perfection, they expect you to deliver what you promoted. To improve your video presence and become a better broadcaster, it takes time but you can definitely get there. When it comes to live streaming, the saying “Practice makes perfect” couldn’t be more accurate. If you apply these tips on every live streaming session, you’ll see that each video will be better and better. If you are looking for ideas for your next live stream, check out this blog post.